Posted on July 8, 2013 by Susan H.
And a show…The Three Musketeers. 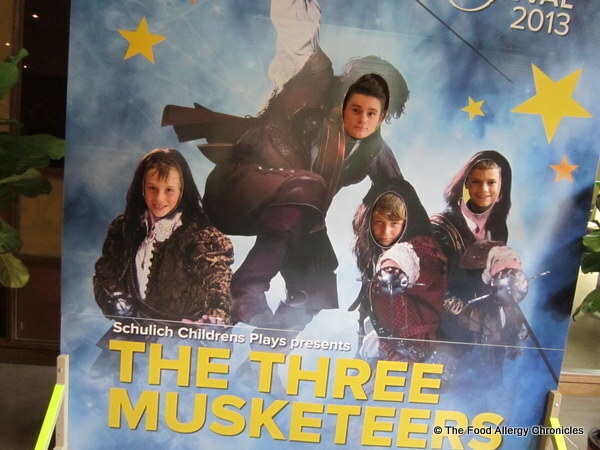 This was the third Stratford play for my boys…their first was Oliver and then Peter Pan…they were fabulous! For my nephews, this was their very first ‘taste’ of the theatre…a great introduction to the theatre for the boys. 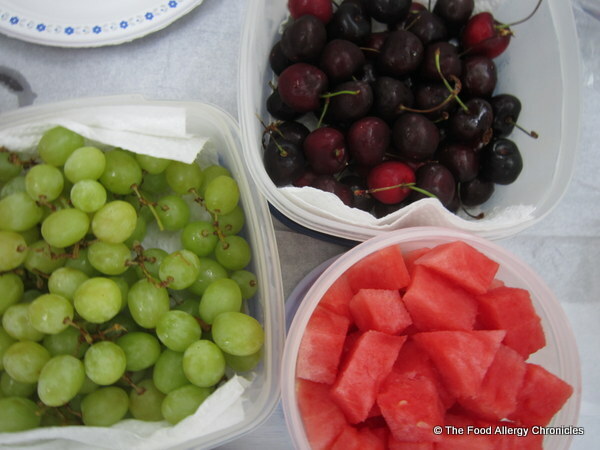 On the side were fresh veggies (carrot sticks, red pepper and cherry tomatoes) and fruit (cherries, grapes and cubed watermelon). 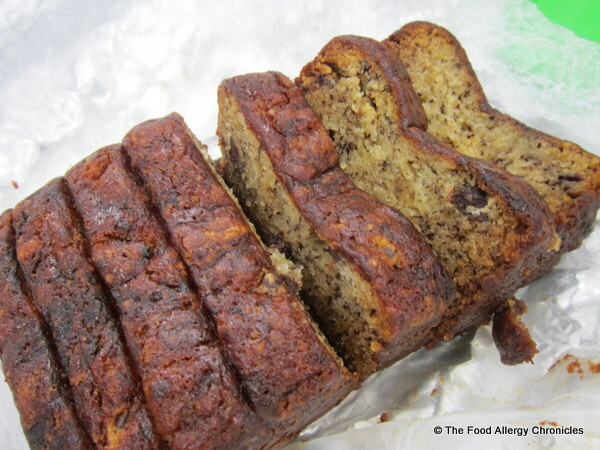 Slices of Dairy, Egg, Soy and Peanut/Tree Nut Free Banana Chocolate Chunk Bread were a hit. I saved the Dairy, Egg, Soy and Peanut/Tree Nut Free Chocolate Chip Cookies and Dairy, Soy and Peanut/Tree Nut Free Rice Krispie Squares for the ride home with any leftover fruit. I think the highlight of the day could have been the ducks and swans down by the Avon River where we picnicked. The boys were enamoured…I think Michael took about 150 pictures and cut it down to 70! 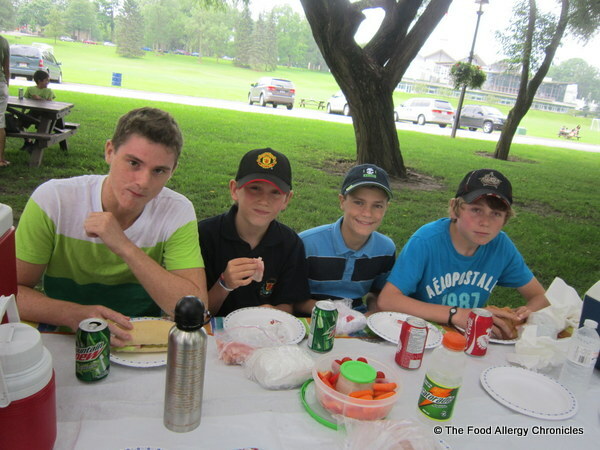 Picnics are perfect for solving where to eat when you have food allergies…and busy boys that like to get up and run around to expend some energy and explore. 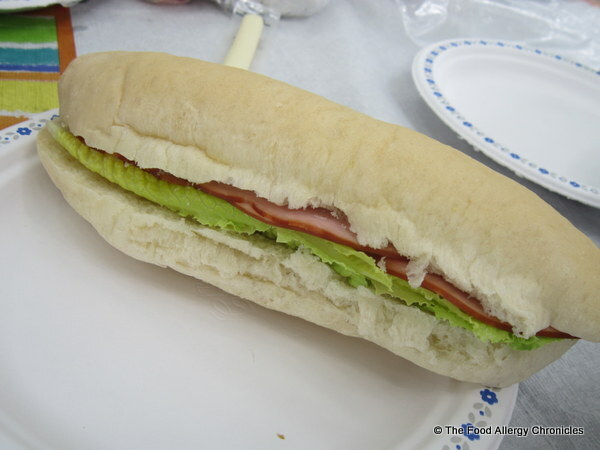 Do you try to incorporate a picnic lunch into your travels? P.S. The table was covered with a table cloth to avoid any food contamination from previous picnickers. A fork was used to take pieces of cubed watermelon, the grapes were cut into small bunches and the cherries were carefully pulled out one by one in order to reduce any cross-contamination. 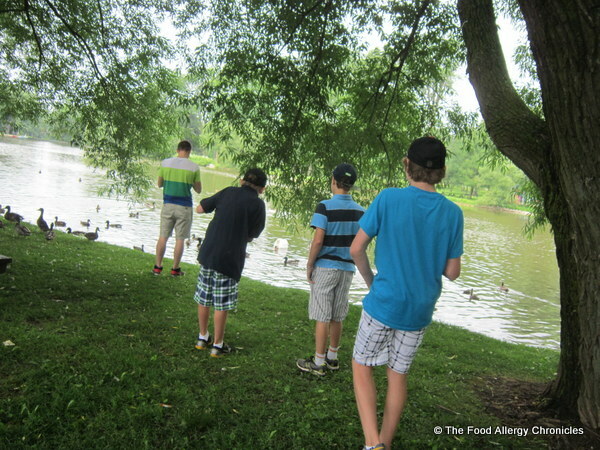 This entry was posted in allergies, baking, breads, cookies, dairy free, egg free, lunch, multiple food allergies, peanut/tree nut free, soy free, Travelling and tagged an allergy friendly picnic, Stratford Festival, The Three Musketeers at Stratford by Susan H.. Bookmark the permalink. John looks so thrilled in the “all for one” photo!!!! They must be having a good time as we have not heard from either one of them! !